Casting Call: Are you the next XSRE girl?! Find out this Saturday at the Paramus Towne Square XSRE Store! Attention all fabulous fashionistas!!! Are you model material? Do you have serious style? Do you take zillions of fashion related instagram pics? Or do your friends always ask you for outfit advice? Then you might just have what it takes to be the next XSRE girl! 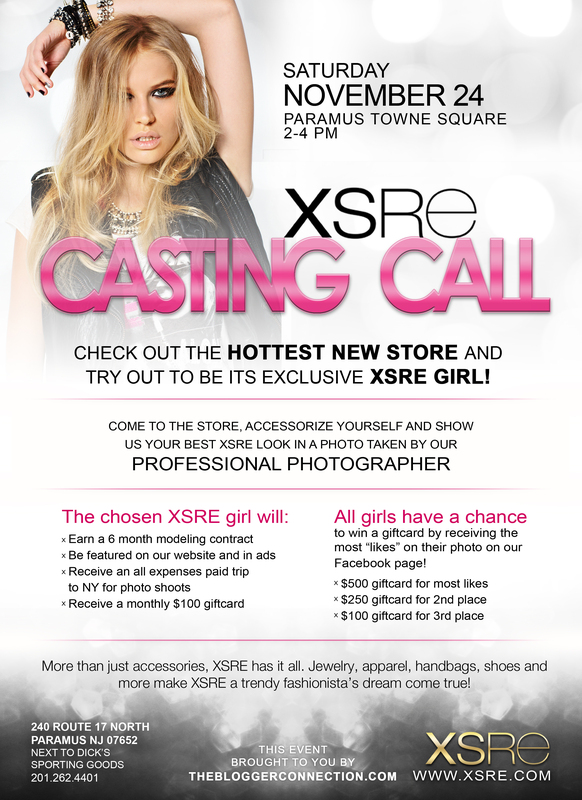 This Saturday only Paramus Towne Square new XSRE Store is hosting an open casting call for their next XSRE girl. One lucky fashionista will win a six month modeling contract and become the face of her store!!! All guests will have the chance to giftcards through XSRE’s facebook promotion, and the chosen XSRE girl will not only win a 6 month modeling contract, become the face of her store, but also be feature d on XSRE’s website and ads, receive an all-expenses paid trip to NY for photo shoots, and receive monthly $100 XSRE giftcards! So if you’re heading out to Paramus Towne Square to do a little holiday shopping this Saturday – then get glamorous and stop by XSRE’s store between 2-4 pm and have your photo taken by a professional photographer and maybe you’ll be the lucky fashionista to win!!! Here are all the details- and good luck! ← Bonding & Beauty with Benefit and MamaDrama!